Rogozin for the Arctic viceroy? 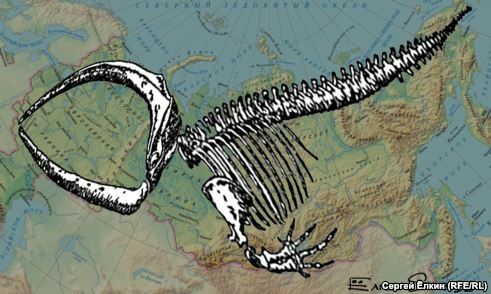 This reflection on the award-winning film Leviathan is done by Russian cartoonist Sergei Elkin (Svoboda.org). It has become clear that the plan for establishing a super-ministry for the Arctic has been reduced to setting a government commission, which according to some lobbyists in the Duma, would put security first (Arctic-Info, February 11). Kommersant (February 6) reported that Dmitry Rogozin is approved as the head of this commission, and RIA-Novosti (6 February) confirmed that rumor. It is a disappointing news for many in the Arctic community, who seek to keep cooperation on track (Barents Observer, February 6), because Rogozin is in both the EU and the US sanctions list (BBC, 19 December), and is very vocal in condemning the sanctions (Nezavisimaya gazeta, February 5). His emphasis on “hard security” matters does not bode well for the prospects of SevMorPut, which suffered 77 reduction in commercial transit in 2014 (Kommersant-Vlast, February 12). I do remember the old Soviet film “Nachalnik Chukotki” (The Master of Chukotka) about a young idealistic komsomolets who found himself in charge of a vast Arctic region and did a remarkably good job in improving the life of locals. Rogozin, who thrives on confrontation and scandal, is certain to be a very different kind of nachalnik.